The Black Agate Thunderegg Mine, located in California’s Colorado Desert, gained fame in the mid-1980s when a number of its outstandingly beautiful nodules and geodes were displayed at several of the large rock and mineral shows in Quartzsite, Arizona, in 1986. By then, though, it had been known for decades. A visitor in the mid-1950s, basing his conclusion on the age of discarded automobile parts he found scattered about, decided that it must have been discovered sometime in the 1930s  probably the late 1930s. Exactly who discovered it first, and when, remains uncertain. In addition to geodes and nodules, collectible material that can be found at the Black Agate Thunderegg Mine includes jasper, opalite and rhyolite. The latter sometimes offers seams of agate of many different colors, including, of course, black. 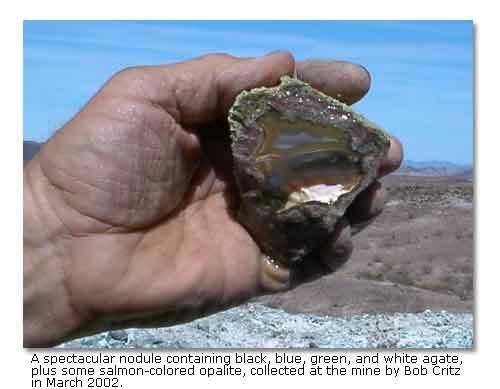 My first experience with the Black Agate Thunderegg Mine occurred in the mid-1980s, when my wife, Karen, and I were doing some research on the Bradshaw Trail, an old gold-rush route leading from the inhabited coastal and inland parts of California, across the Colorado Desert, to La Paz, Arizona. We were checking the various side roads. One led to a dug-up area where two men were shoveling out a hole. We approached, explained our presence, and asked if they would be willing to tell us about the dig. Not only did they inform us about the black agate and geodes that could be obtained, they also showed us a geode that had cracked open upon extraction. Attached to the wall of the hollow center of that geode was the perfectly shaped shell of a crystal. It was so thin and delicate that even a slight puff of air would make it sway, much like a tree does in wind. The leader of the diggers, who we later learned was Robert Colburn, the expert on geodes and nodules better known as the “Paul, the Geode Kid,” explained that it was so fragile that they had no hope of transporting it intact to their destination. He handed it to Karen, telling her that if she held it in her lap all the way she just might get it home. Karen did, and it arrived in one piece. A few years later, though, a nosey and injudicious visitor picked it up and destroyed it in one quick motion. Ah well . . . ! We have never found another one like it, but we keep hoping. Should we be so fortunate, we’ll keep it in a locked display case bolted to the floor or built into a wall! Maybe you will be the next lucky finder. If so, please remember the lesson Karen and I learned the hard way! The main reason to hunt for geodes at the Black Agate Mine is that they are extremely unusual. Thundereggs from many different locales contain agate, but only a limited number offer black agate. And when they do, it usually is only a thin layer or two. 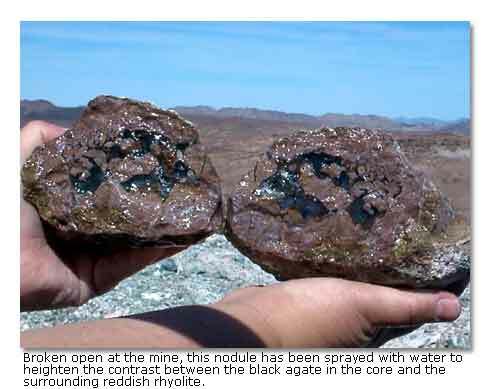 Black Agate Mine geodes and nodules may contain thick layers of rich black agate. So also do some of the thundereggs from the nearby North Black Hills Thunderegg Beds and the Hidden Saddle Beds, but they generally are not as spectacularly colorful. Digging at the Black Agate Thunderegg Mine is not easy. Of course, it is possible to dig in the already disturbed volcanic ash  according to Robert Colburn, the ash is decomposed perlite  with even the flimsiest of shovels and with relatively little effort. But that will net little more than material others have discarded. For a couple of years around 1990 an enterprising soul attempted to turn the mining of Black Agate geodes into something of a paying proposition. He  or she  erected a payment box at the site and invited those who dug there to leave behind some of their money when they departed. Although I checked the box three or four times, just to see what it might contain, most of the time it was empty. Once, toward the end of a long weekend, it held a dollar bill. The next time I checked, the payment box was nowhere to be found, and I have not seen it again. Also known as the Black Agate Bed and Black Agate Site, it was the Geode Kid who began calling the location the Black Agate Thunderegg Mine. With good reason, too. Rockhounds who expect to leave with any significant number of thundereggs from this site will need to be prepared to do some real mining, much of it in hard rock. The road to the thunderegg mine was shared by the Little Brother Gold Mine at one time. A number of years after the Little Brother shut down, someone in the Bureau of Land Management apparently decided all sign of it should cease to exist. Just why is not readily apparent. It could not have been for safety because the entrance was protected by a heavy steel door that was welded closed. Whatever the rationale, the site was bulldozed, part of the road was ripped up, and high earthen barriers were constructed at the approaches to two washes. Consequently, reaching the Black Agate Thunderegg Mine is nowhere near as easy as it used to be. 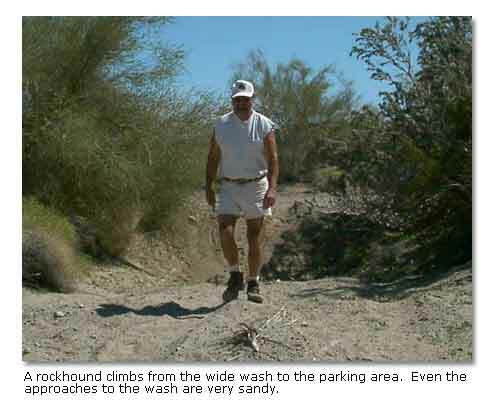 Until at least the two southernmost soil barriers either wash away or pack down  something that may never happen, but could with the next rainstorm  those hoping to visit the location in their own vehicles should expect to have to drive through deep, loose sand to cross the larger of the washes. Because even vehicles with four-wheel drive can bog down if it has been a dry year, especially after the sand has been churned up by earlier arrivals, the best approach is to park on the north side of the main wash and walk the remainder of the way to the collecting site. The distance from the wash to the dig is only 0.3 of a mile. Therefore, the directions that follow are for those who plan to walk the final stretch. 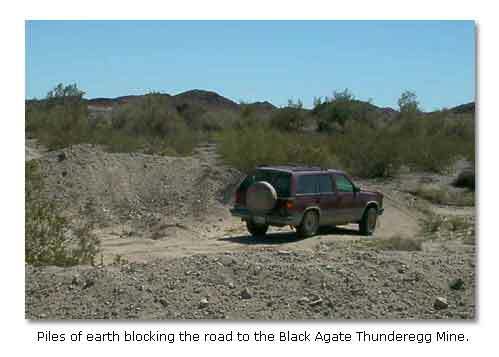 The most popular way to reach the Black Agate Thunderegg Mine is to leave Interstate Highway 10 at the Wiley’s Well Exit, about 15 miles west of Blythe, California. Drive south on Wiley’s Well Road, past the turn-off to two state prisons and the entrance to the Wiley’s Well Campground, a total of 9.5 miles to the Bradshaw Trail at 33°29.457' N and 114°53.278' W. Then turn westward and drive 13.3 miles to a junction at 33°24.754' N by 115°05.198' W. Turn southward, then eastward, off the Bradshaw Trail, and drive a quarter mile to a junction at 33°24.784' N and 115°04.966' W, where you need to bear right. Once the road straightens again, on a brown hill in the near distance just to the right of the road, you will be able to see your destination as a gray discoloration. The first set of piled-earth barriers is only another quarter mile ahead, at 33°24.619' N by 115°04.752' W. Before driving around the obstacles, check to determine that it is safe to do so. If it is  and most of the time it is  and if the road on the other side is not too sandy, continue another 0.2 mile southward to the north side of a fairly wide, sandy wash. It is best to park there, at 33°24.564' N by 115°04.679' W. Continue southward, across the wash, on foot. Once you have climbed up the south bank and around the trees that line the wash, you will see the Black Agate Thunderegg Mine approximately 0.3 mile southeast of your position, at 33°24.374' N by 115°04.474' W.
The best time to go digging for nodules and geodes at the Black Agate Thunderegg Mine is from late October to early April. Southeastern California’s Colorado Desert is a rather warm place in the summer, with high temperatures commonly reaching 115 to 120 degrees. 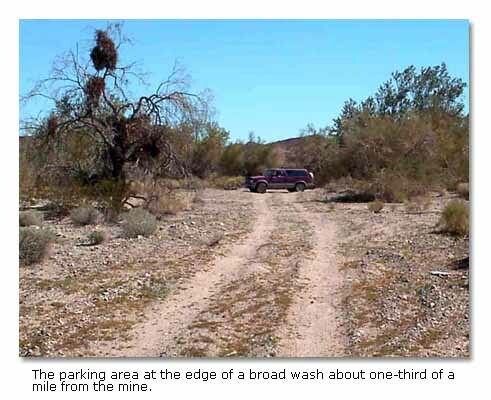 A vehicle with four-wheel drive and high clearance may be necessary because of deep sand on the Bradshaw Trail west of Wiley’s Well Road. Do take along mining tools such as picks, shovels, and pry bars. When you go, be sure to go prepared. A little extra fuel and oil can be lifesavers. Some extra food can be useful, too. Above all, take plenty of drinking water, because none is available at the mine. Without even realizing it, a person digging on the desert can become seriously dehydrated in a matter of an hour or two, so, in addition to taking plenty of water, be sure to drink the water you take! Although service is spotty at best, a cell phone sometimes can be used to summon help in the event something goes seriously wrong. But the best insurance against problems at the thunderegg mine is to have another vehicle along  and a good tow strap. Should you be interested in camping, you might consider Wiley's Well Campground in the Mule Mountains Long Term Visitor Area (LTVA). It offers pit toilets, picnic tables, nonpotable water, and perhaps best of all, some shade. There is no fee for camping during the off season, but there is a fairly substantial charge during the regular LTVA camping season, from September 15 to April 15. You may also camp near the mine. Just stay on public land within 300 feet of an existing road. Other accommodations, services and supplies are available about 40 miles east in Blythe.